Seattle – June 08, 2010 – DocuSign®, provider of the most trusted SaaS-based electronic signature platform announced that the Chico Association of REALTORS® (AoR), the leading professional real estate association in Northern California's Butte and Glenn counties, selected DocuSign eSignature service as its exclusive e-signature provider. Chico AoR now offers the DocuSign service as a benefit to its membership of more than 400 real estate professionals. "Everyone loves DocuSign and the Association wanted our members to have the best. 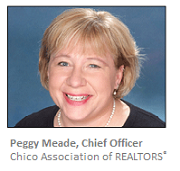 It just made sense to include DocuSign as a member benefit," said Peggy Mead, executive officer at the Chico Association of REALTORS®. "Together, we'll help real estate professionals quickly and easily close deals in a very competitive market. Plus, DocuSign's integration with our forms tool makes managing and completing piles of paperwork less stressful. You just point, click and DocuSign it. It's easy." Established in 1956, the Chico Association of REALTORS® is the largest real estate trade association in Butte and Glenn counties. It joins more than 30,000 other real estate professionals and thousands more each month leveraging the DocuSign eSignature service to ensure success. With DocuSign, Chico AoR members will no longer need to drive across town to get a signature or force clients to find a fax machine. Rather, members can use DocuSign for REALTORS® to execute agreements with buyers and sellers electronically, eliminating the old process of printing, faxing and waiting for the return fax. With real estate forms signed in minutes, not days, DocuSign real estate professionals achieve higher sales, increase client satisfaction and maintain a competitive edge. Safe and secure, the DocuSign e-signature process is also easy to use and legally compliant. "We are proud that the Chico Association of REALTORS® has selected the DocuSign eSignature service as an exclusive member benefit," Dave Thorpe, market director at DocuSign. "DocuSign is the leading e-signature provider for the real estate industry, and it's no surprise that adoption rates continue to increase, especially with FHA accepting DocuSign electronic signatures. It's clear that automating the signing process helps real estate professionals save time, money and increases customer satisfaction. We anticipate more and more organizations such as Chico AoR to adopt DocuSign as the standard." DocuSign, Inc. is the leading provider of on-demand software services for electronic signature. DocuSign empowers individuals, small businesses and global enterprises to operate faster and more efficiently, with greater profitability, enhanced security and compliance. DocuSign is the only Web-based service to securely automate and control the entire electronic document signing process. DocuSign employs the SaaS eSign industry's only enterprise class SAS-70, fully redundant data center delivering 99.993% uptime for customers over the last 32 months. To date, more than 79 million signature events have been executed using DocuSign. In addition, DocuSign is the official and exclusive provider of e-signature services for the National Association of REALTORS® 1.1 million members, under the REALTOR Benefits® Program.